American orbital launch vehicle. Boeing study, 1967. 4 156 inch solid propellant boosters; Saturn IC stretched 498 inches with 6.64 million pounds propellant and 5 F-1 engines; S-II standard length with 5 J-2 engines; S-IVB stretched 198 inches with 350,000 lbs propellant, 1 J-2 engine. Status: Study 1967. Payload: 223,500 kg (492,700 lb). Thrust: 72,338.40 kN (16,262,319 lbf). Gross mass: 6,342,540 kg (13,982,900 lb). Height: 123.00 m (403.00 ft). Diameter: 10.06 m (33.00 ft). Apogee: 185 km (114 mi). LEO Payload: 223,500 kg (492,700 lb) to a 185 km orbit at 28.00 degrees. Payload: 85,600 kg (188,700 lb) to a translunar trajectory. Flyaway Unit Cost 1985$: 174.000 million. Stage 0. 4 x UA 156 inch. Gross Mass: 544,311 kg (1,200,000 lb). Empty Mass: 37,195 kg (82,000 lb). Thrust (vac): 8,924.482 kN (2,006,303 lbf). Isp: 263 sec. Burn time: 157 sec. Isp(sl): 238 sec. Diameter: 3.96 m (12.99 ft). Span: 3.96 m (12.99 ft). Length: 34.00 m (111.00 ft). Propellants: Solid. No Engines: 1. Engine: UA-156. Status: Development 1965. Stage 1. 1 x Saturn MS-IC-25(S). Gross Mass: 3,223,800 kg (7,107,200 lb). Empty Mass: 211,900 kg (467,100 lb). Thrust (vac): 45,925.500 kN (10,324,463 lbf). Isp: 304 sec. Burn time: 192 sec. Isp(sl): 265 sec. Diameter: 10.06 m (33.00 ft). Span: 19.00 m (62.00 ft). Length: 54.70 m (179.40 ft). Propellants: Lox/Kerosene. No Engines: 5. Engine: F-1A. Status: Study Boeing 1967. Comments: S-IC with 41.5 foot stretch, 6,640,0000 lbs propellant, uprated F-1 engines. Stage 2. 1 x Saturn MS-II-4(S)B. Gross Mass: 494,100 kg (1,089,300 lb). Empty Mass: 42,300 kg (93,200 lb). Thrust (vac): 5,169.000 kN (1,162,037 lbf). Isp: 421 sec. Burn time: 355 sec. Isp(sl): 200 sec. Diameter: 10.06 m (33.00 ft). Span: 10.06 m (33.00 ft). Length: 24.84 m (81.49 ft). Propellants: Lox/LH2. No Engines: 5. Engine: J-2. Status: Study Boeing 1967. Comments: Standard S-II but with structural strength increased from 86% to 502% depending on station, resulting in 8.6% increase in empty weight. Stage 3. 1 x Saturn MS-IVB-1A. Gross Mass: 179,200 kg (395,000 lb). Empty Mass: 20,400 kg (44,900 lb). Thrust (vac): 1,031.600 kN (231,913 lbf). Isp: 421 sec. Burn time: 625 sec. Isp(sl): 200 sec. Diameter: 6.61 m (21.68 ft). Span: 6.61 m (21.68 ft). Length: 22.82 m (74.86 ft). Propellants: Lox/LH2. No Engines: 1. Engine: J-2. Status: Study Boeing 1967. 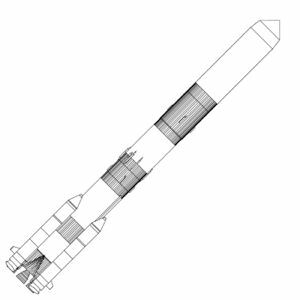 Comments: S-IVB with 16.5 foot stretch, 350,000 pounds propellant, standard J-2 engine. Family: orbital launch vehicle. People: von Braun. Country: USA. Engines: F-1A. Stages: Saturn MS-IVB-1A, Saturn MS-IC-25(S), Saturn MS-II-4(S)B, UA-156. 1964 May 28 - . LV Family: Saturn I, Saturn V. Launch Vehicle: Saturn INT-27, Saturn V-25(S)B, Saturn V-25(S)U. 156-inch solid-propellant rocket motor fired for the first time. - . Lockheed Propulsion Company test fired a 156-inch diameter, solid-propellant rocket motor for the first time. The one-segment test motor (156-3-L), with tab jet thrust vector control, produced more than 900,000 pounds of thrust during its 110-second firing. The test was conducted as part of the Space Systems Division's Large Solid Rocket Motor research and development program (Program 623A).